Ki Shusui Harvest 2014 ! Ki Shusui Harvest 2013 ! All shusui start with Asagi. Asagi is a fully scaled koi, with beautiful blue "netting", that is symmetrical reticulated pattern of blue scales wrapping the fish from the lateral line, then over and across the back of the fish. Asagi also has red "hi" (hee) markings coming up from the belly, and coloring the jaws, cheeks and often the pectoral fins. This asagi is not mine, but is a good representative of its variety. Shusui is a doitsu or "scaleless" asagi. Shusui is judged in the same class. Where Asagi have blue scales from the lateral line across the back, shusui has clean pale blue or white skin and a double row of bold blue dorsal scales. Both fish look best with a clean face and head and distinct markings. Her name is Rosey and she is one of the parents in our F1 2012 ki shusui spawn. Ki shusui is a yellow shusui. The standards for judging this type are the same as for judging (regular) shusui except that instead of red or "hi" markings, the ki shusui has "ki" (kee) or yellow markings. Below, a ki shusui bred here in 2012. 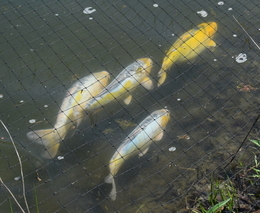 Click on our young ki shusui (above) to see YouTube video of our 18 month old ki shusui and ayawakaba koi harvested in 2013. 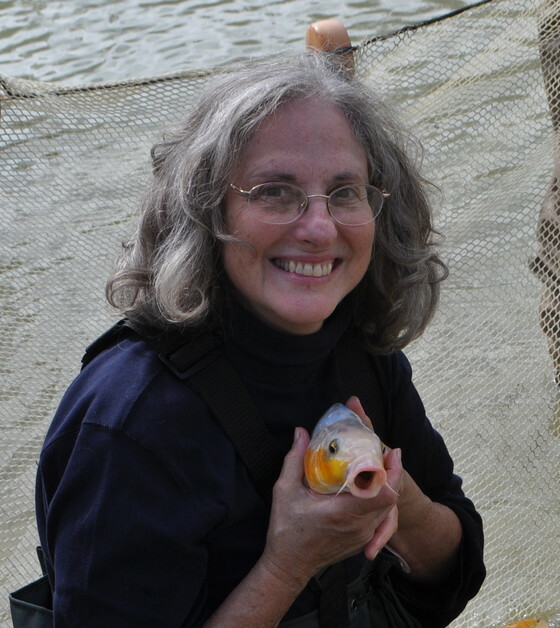 See fish swim! of the Ki Shusui Project! We love ki shusui! This page is an introduction to the "elusive" one and a photoblog of this project that began in 2008 and is a work in progress to this day. Our mission is to create a genetic line of ki shusui so that we can stabilize this beautiful variety -- which has not been done before. The navigation tabs will take you back in time from the most recent harvest and through the history of the project. We will show the hits, the misses, and the great successes of the 2012 and 2016 spawns. 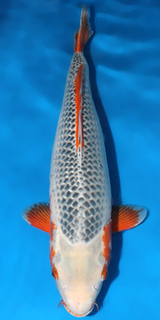 If you don't know shusui, this is a charming, doitsu (scaleless) koi variety, with pale blue or white skin, red markings on the sides and belly, with a bold blue symmetrical double line of scales along the dorsal ridge. One day, either by accident or fate, I learned of the “elusive ki shusui.” This is the same variety as shusui, but instead of red lateral markings, this unusual type has yellow markings on its sides. Wow! See the ki shusui below. It is such a terrific looking koi. But -- pretty much unavailable, because it's not easy to breed. And so, "elusive." The "elusive" ki shusui. This is not my fish. She is the icon for the ideal ki shusui. 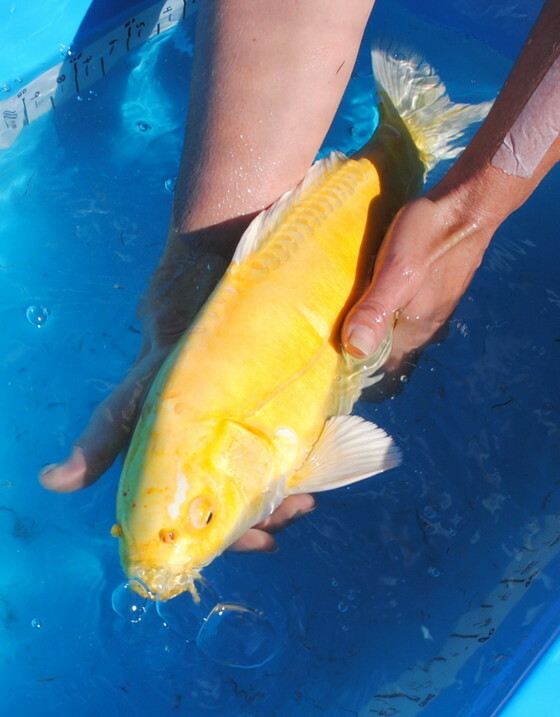 I read what little I could find on ki shusui, (ki means yellow) but learned that although this type of koi is rare, when it ocurred, it was often as a by-product of crossing a green koi called midori with other midori. Midorigoi, a fish that sometimes makes ki shusui. 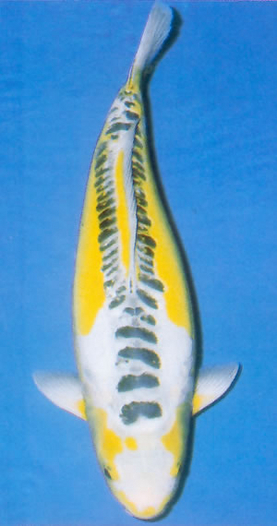 Midorigoi, or midori, is a cross of a standard shusui and a metallic yellow koi called "doitsu ogon." So, this koi has both shusui and ogon genes. It made sense, therefore, if you crossed midori x midori, the resulting fry would have both shusui and ogon genes and a yellow shusui could come this cross of koi. The picture below is is one of my midorigoi. Her name is "Jade." Doitsu Ogon is a koi with "metallic" skin, beautiful its own right, and is often the source of "ki" when creating midori. Ogons come in three solid color types; platinum, yellow, and orange. This is the short version. ;) When trying to breed ki shusui, I crossed shusui with yellow ogon to produce midori. I planned to cross these home-grown midori with hope of getting ki shusui as a byproduct. While I did get many midori with this cross, I also got a number of ki shusui with enough desirable traits so that I could cross ki shusui, rather than wait for midori offspring to mature to breeding age. 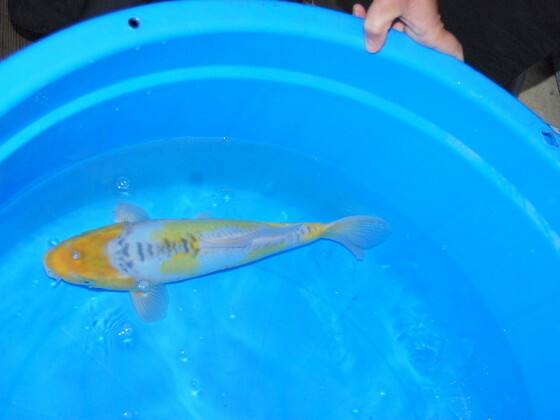 This is one of my doitsu yellow yamabuki ogons, by the name of Capone. "Ayawakaba," translated, means "fresh new leaves on water." This is a variety in progress now in Japan. Ayawakaba also shows up as a byproduct of a midori x midori cross and also from a shusui x midori cross. It has similar or even identical genetics to ki shusui. But it differs in appearance in that rather than lateral shusui markings, the pattern on this variety crosses the back of the fish, "a dorsal orientation." 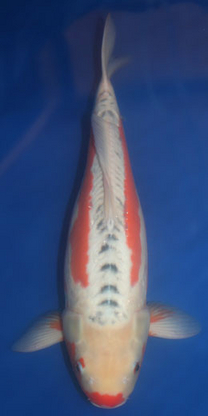 This variety often has an colored head and face, while ki shusui should follow show standards for shusui. The standard for shusui is a clean head and face with some cute markings as exceptions to the rule.. The ayawakaba below is not mine. But, it is a pretty good example of the type. 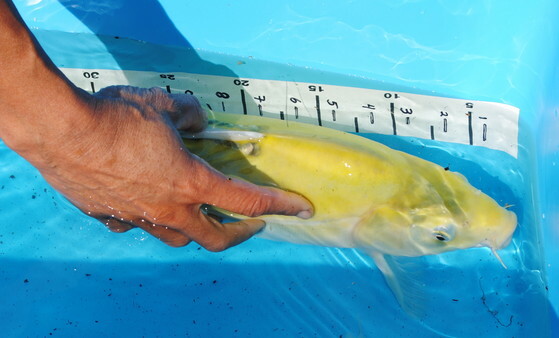 The fish, below is a doitsu lemon hariwake. I had the idea to add this variety into the general mix for its "lemon" coloration. I didn't take into account the effect of the platinum skin on the offspring. Instead of ki shusui, I got plenty of kinsui, or metallic shusui and a bi-colored matsuba. Neither of which did I want. I have a field to the north of my garden and there is a spring in the middle of this field. I decided to put in a new mud pond and dedicate it to trying to breed ki shusui. That was in 2008. 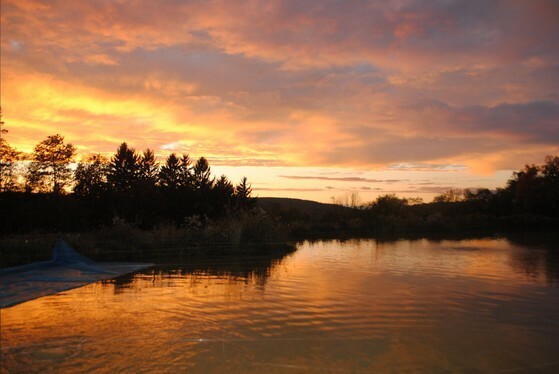 Here, under an autumn sky. 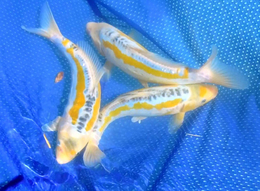 To begin I bought about twenty oyagoi -- that is parent fish: three shusui females, six midori, two ayawakaba males, two yellow ogon males and I added a “twist” of my own; several doitsu lemon hariwake of both genders. A fish friend seemed dismayed by my idea for this project. He said, "I've never heard of anyone putting this combination of fish together -- on purpose!" I didn't know that. I was trying what made sense to me. And, I did have some success. Not enough success to call this project a good business model, but I did achieve several ki shusui. Pictured below is one of the two I think are the best of the batch. My best ki shusui in 2012. Yay! Below, I am looking quite happy with my best ki shusui from the 2010 spawn. 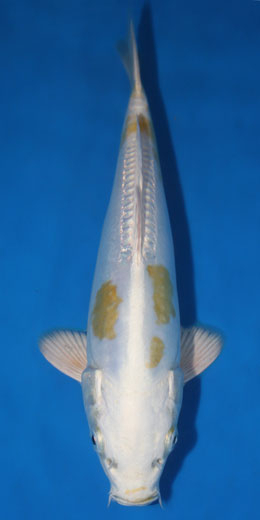 Her ki is not as bright as that of the iconic ki shusui, because this fish has a sky blue skin which is the standard base color of the shusui variety. When yellow overlays blue, it shows greenish or less vivid than when yellow is overlaid on white skin. The blue skin on this fish may fade toward white -- she's still very young -- and if it does, this very nice ki shusui's ki will become more buttery. Similarly, her blue dorsal scales may become more pronounced in time. 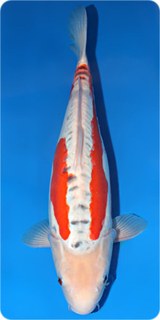 This very pretty fish won a best Kawarigoi award in Koiphen's 2012 Virtual Koi Show. And she has breeding stock potential in the years to come. Yahoo! Click on the three ki shusui (above) to read an article in Main Street Magazine about our "elusive ki shusui," published in November, 2014. Click on photo above of four oyagoi to jump to the rewarding 2017 Spawn. KiShusui.com is a record of my efforts to breed and stabilize the "elusive" ki shusui. I'm sorry, but we do not sell koi -- or anything else! But, we do enjoy hearing from other koi lovers. You can reach Maxine at Max@kishusui.com or kishusui@aol.com.